If you love to purchase handmade items crafted by global artisans (or if you just like cool jewelry, items for your home etc…), be sure to check out NOVICA, an awesome website that gives artisans around the world a global platform to express their true artistic talents. We benefit too, because as consumers we are given access to unique, hard-to-find items at great prices! NOVICA wants you to feel an attachment to the product you’re buying and the hands that made it. They don’t charge artists for posting items on their website and the artists remain fully independent. For the next week NOVICA is also offering FREE shipping on most items! I paid $2.99 shipping for my hammock, still a great deal! NOVICA recently started a home based business company called NOVICA Live. If you have been looking for a business where the market isn’t saturated this is your opportunity to start very early! It’s a really neat idea; you bring a in-home travel experience to each party as guests learn about the countries and artisans that are making the products. You’ll earn commissions of 20-30% or more as you advance, plus they have fun trips every year to go and meet the artisans and visit areas that NOVICA is working with (this year it’s an all expenses paid trip to Bali). 1 lucky Stretching a Buck winner will win $100 credit to NOVICA! This giveaway was sponsored by NOVICA as part of the Win Giveaways 2011 Spring Giveaway Bash. This post was written by me and was not edited by the sponsor. Read more in my disclosure policy. Find more information on the terms for this giveaway on the Win Giveaways Facebook page. I would love to buy one of their sinks on Novica!! A big fan on FB!! A current subscriber on email! I would pick the Daily Deal so I can stretch my money. I love the wise owl pendant! Great giveaway! The cotton sling tote bag in royal emerald, or any of the bags by Jiap Rojjana. 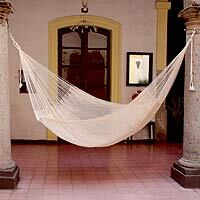 I have always wanted a chair hammock so that is what I would get one from Novica if I won the $100.00 gift card. I would buy the cotton hammock, ‘Brazilian Rainbow’. Just love it. I would get the jungle grapes necklace. I would definitely order the “Ocean Dreams” cotton hammock! The soft white throw looks both cozy and beautiful. I would choose the Alpaca wool reversible blanket, ‘Moonlit Winter’s Night’. Actually my dad would love a hammock! I like the confetti pitcher! A welcome sign and a wind chime is what i would get. I really like the Stained glass folding table, ‘Tamayo’s Mandolins and Pineapples’. I would purchase the onyx and marble chess set for my husband. Current subscriber to your emails. Thank you. Luv the Cotton hammock swing, ‘Sandy Beach’. I would order the Garnet Pendant Necklace “Ravishing Red”! Oh a hammock would be great in our yard too! Thanks! So many beautiful items… right no I am loving the hammock. I am with you…I would definitely purchase the hammock! I have wanted one for such a long time! I would buy all the cobalt spiral glassware! My husband and I were just talking about a hammock. This would be perfect! I would purchase one of the art glass mirrors or a hammock for our new home! I think my husband would love the hammock! I would get the cotton sling tote Dragon Battle. Love it! would love to have a hammock!! I’d love to get a hammock! My husband just told me last night that he’d love to have a hammock! I think I’d have to get that, too! I would buy my husband cuff links- they are really nice. I’d love to have one of the wool rugs like the Garden Charm 6 x 9 rug. It would be hard to choose my favorite! So many things!!! I love the statues though. Anything Asian of African. A current subscriber via email and fan on Facebook! I like the 13″ Cedar Crucifix! I would purchase the Color of Nature II Painting! The garnet flower bracelet is nice. I’d get the Natural orchid and tiger’s eye long necklace, ‘Whipped Cream’. The hammocks look awesome. I like some of the handbags too. Soooooo many choices…..I love the Mohena mirrors. I like the Carribbean Jumbo Hammock in blue. Any of the gorgeous wine glasses they have! I’d get the Pearl strand necklace, ‘River of Snow’ by Sasina. I would get some picture frames. I like Auto part chess set, ‘Rustic Pyramid. The hammock would be a great gift! I would buy the wise owl pendant for my mother-in-law! i looooove the passion painted glass jewelry box!! I love the Sterling silver long strand necklace, ‘Harmony’. I liked you on Facebook today! Email contains name. I would most likely get one of the Art Glass mirrors. I like Leather laptop case, ‘Notorious’ (dark brown) for my dad. I’d probably get one of their art glass vases. I think I’d choose the Murano handblown vase, ‘Sails at Sunset’. It’s hard to choose…so many lovely things. I subscribe to your feed. Thank you. I’d like the Mirror, ‘Pink Floral’ for my daughter’s bedroom! There is a crimson painted glass tray that I love. i love the cosmopolitan earth blouse! Following you on FB too as Georgia C.
I would get the Cotton Happy Elephants shoulder bag and some jewelery as well. I would like a new mirror for our entryway. I would get the Mahogany and ebony decorative box, ‘New Leaf’ by Francisco Mendoza. I love the baskets. I’d definitely go for one of those. I’d love to get the Blue Caribbean hammock! I think Hubby would like the hammock!! I would love to get the Marble chess set, ‘Sophisticate’. Like Stretching a Buck on Facebook – today!